When the festive decorations go up, many of you will remember all those happy hours of their childhood when they got shiny baubles and cut-out angels out of their boxes, fashioned stars out of transparent paper for the windows or assembled pendants of gilded walnut shells for the fir-tree twigs. My brother and I busied ourselves with building a new landscape for the nativity figures every year, using real moss and pine-cones, and I still have and use an advent calendar which I made for my parents at the age of seven. The teachers and parents amongst you may be looking for seasonal activities for children and ask themselves if the Newsam Library has any resources to give them ideas, both for Christmas stories and the great Christmas story itself, and for decorating your classroom or home. Of course we do; our Curriculum Resources collection consists of all kinds of books for teachers and children. Beyond that, we have prepared links to online resources for you, as you can see in our recent blog post on games and crafts through the seasons. 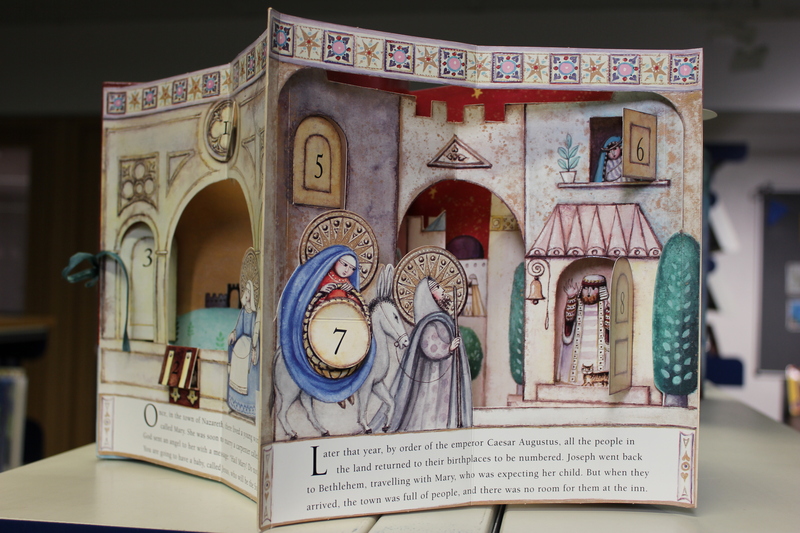 But what about making a book that is a three-dimensional nativity scene at the same time? We have three wonderful titles to offer you. The children in your charge will be thrilled to get going with cardboard and paint, scissors and glue, to make one of their own! The nativity by Jane Ray (1999) is colourful in every sense of the word: The angels wear flowers and feathers in their hair; the Three Wise Men display an ancient map and Arabic and Chinese writing on their cloaks; Mary has a long black plait and Joseph curly black hair (such as we now assume Jesus may have had). 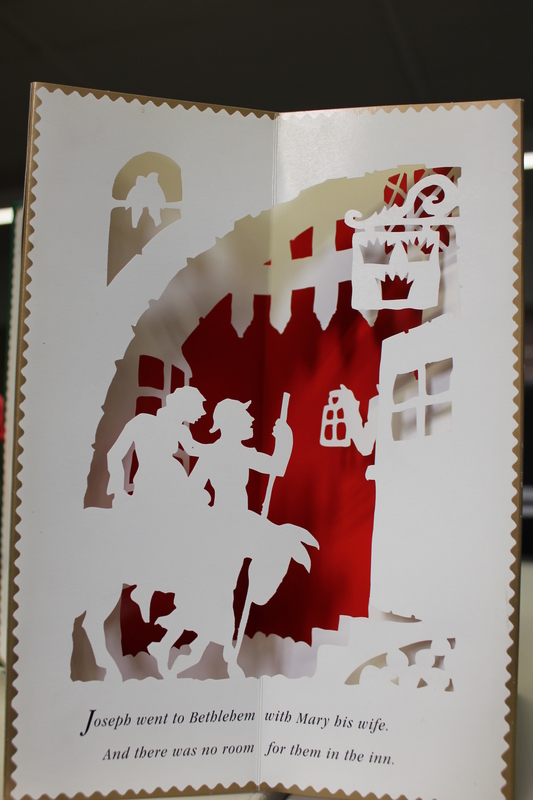 The last page folds out to a palace-like stable, and you can populate it with paper figures supplied in a pocket. The first Noël : a Christmas carousel by Jan Pieńkowski (2004) and An Advent carousel by Francesca Crespi (1999) take the idea further by having every double-page pop up, so that the story literally unfolds as you go along! 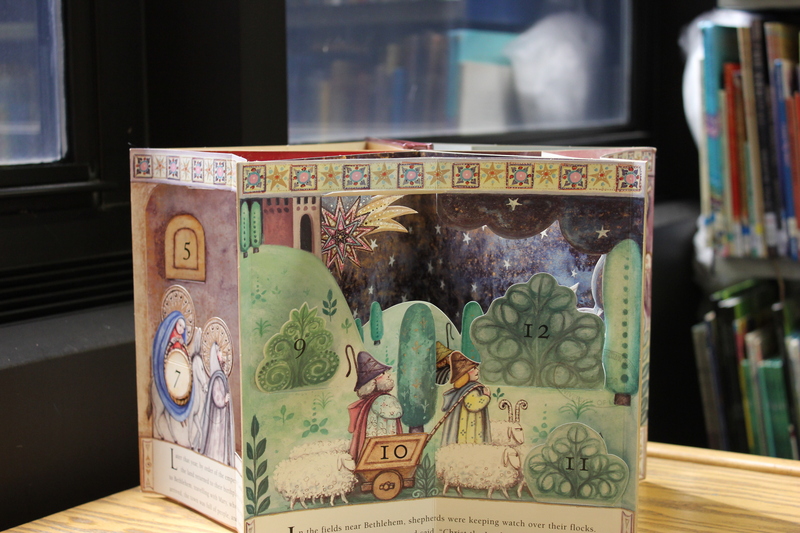 Each book can be displayed with all scenes open, looking like a star from above; The first Noël even has a loop to hang it from as one large decoration in a Christmas colour scheme. The Advent carousel, in turn, has 24 little flaps, so functions as a proper Advent calendar. There is a lot of lovely detail, too, to inspire children’s imagination and integrate their own lives into the story from Antiquity. In Crespi’s 3-D book, when you open Mary’s chest, you find wool and knitting kneedles, and her basket is filled with loaves of bread and apples. In the shepherds’ cart, little lambs lie like in a manger, and behind a bush, a child and a shepherds’ dog are asleep. Each angel is playing a different musical instrument, and the comet to announce the birth of Jesus resembles a multi-coloured, multi-layered decoration in itself. Pieńkowski’s accomplished silhouettes will awe any adult, for instance the dramatic apparition of an angel in the fields, coming down like a hawk and stretching his hand out almost to the humans’ hands. Again, there are endearing references to our environment – can you find the cat and the squirrel? The sign in front of the inn is a board painted with three crowns hanging from a wrought-iron rod, something you could not have found in Roman Israel but anywhere in Britain or in Central Europe, the artist’s first home. 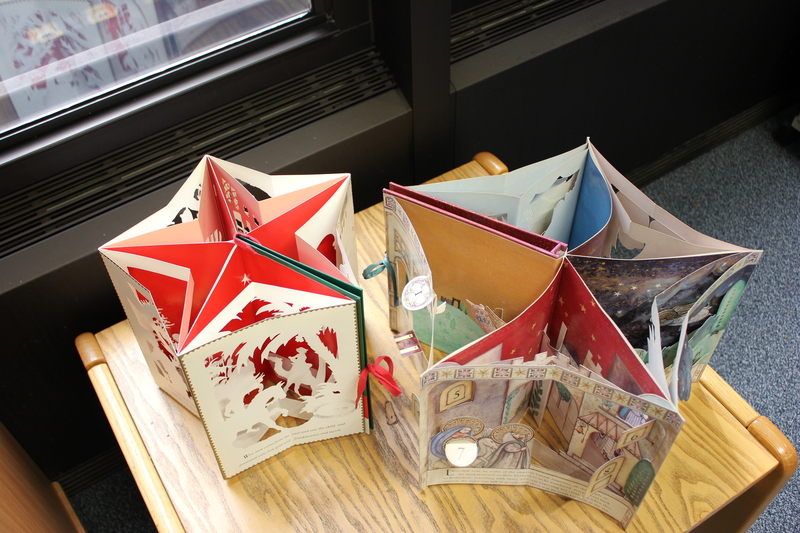 In a previous blog post, I suggested other pop-up books from the Newsam Library to study, for instance about outer space; why not emulate some of their features, too, for your very own Christmas project? If an elaborate scene is too ambitious, why not start with single objects, as Robert Sabuda does in his Christmas Alphabet? His paper cutouts are sheer delight, and he even manages to visualise ‘Joy’ ─ I won’t tell you how! A happy Christmas time to all of you, whether you grew up with life-size nativity scenes in churches and on squares, as I did in Germany, or whether you have never celebrated it in your country before. This entry was posted in Curriculum Resources and tagged art education, Christmas, crafts, Curriculum Resources, Jan Pienkowski, picture books, pop-up books, religious education. Bookmark the permalink.